The number of seriously underwater homeowners stood at 6.9 million -- or 12.7 percent of all homeowners with a mortgage -- at the end of the third quarter. More than one in five homeowners with a mortgage was seriously underwater in 15 of 102 major metropolitan statistical areas, including Las Vegas, Cleveland, Orlando, Tampa, Chicago, Detroit and Miami. Meanwhile, more than one in five homeowners with a mortgage was equity rich in 27 of the 102 metro areas, including San Jose, San Francisco, Honolulu, Los Angeles, New York and Pittsburgh. The number of U.S. homeowners seriously underwater — owing at least 25 percent more on combined mortgages secured by their home than the estimated market value of the home — dropped by 1.2 million in the third quarter of 2015 compared to a year ago, according to RealtyTrac public record mortgage data. The number of seriously underwater homeowners stood at 6.9 million — or 12.7 percent of all homeowners with a mortgage — at the end of the third quarter, which is the lowest level since RealtyTrac began tracking in the first quarter of 2012. The number of seriously underwater homeowners stood at 6.9 million — or 12.7 percent. Meanwhile, homeowners considered equity-rich — with at least 50 percent equity — continued to outnumber those who are seriously underwater. A total of 10.5 million homeowners nationwide were equity rich as of the end of the third quarter, 20.1 percent of all homeowners with a mortgage. Not all markets are following this trend, while others are well ahead of it, as illustrated in the interactive maps below. 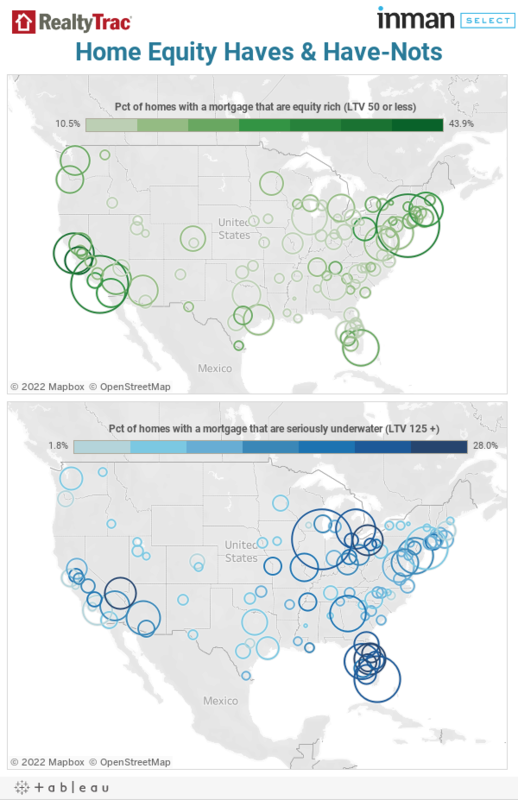 Hover over the bubble on any market to see the number and share of equity-rich homeowners (home equity haves) on the top map and the number of seriously underwater homeowners (home equity have-nots) on the bottom map. Below the map are some additional high-level takeaways. More than 1 in 5 homeowners was seriously underwater in 15 of 102 major metro areas. The number and share of seriously underwater owners was larger — in most cases substantially larger — than the number and share of equity-rich homeowners in all 15 of these markets. Meanwhile, more than one in five homeowners with a mortgage was equity-rich in 27 of the 102 metro areas, including San Jose, San Francisco, Honolulu, Los Angeles, New York and Pittsburgh.